Fresh from setting the world of athletics alight by running a blistering new world record time of 9.58 seconds in the men’s 100 meters at the World Championships in Berlin, Usain Bolt has told reporters "anything is possible" for the future. The triple Olympic champion, who is 22-years-old, told the official Web site of athletics world governing body (IAAF) that he could reduce his record-breaking times even further in the future. “Anything is possible. I’m just happy I won. For me, 9.5 is definitely a big thing. I’m proud of myself because I’m the first man to have done that. I never go out there thinking about world records. I just go out there trying to win,” the Jamaican sprinter said. 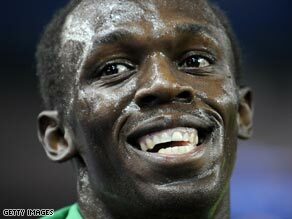 Despite claiming gold at the Olympiastadion on Sunday, Bolt was keen to stress he would not be resting on his laurels. “I think I have to keep doing it year after year. It will take a lot of hard work because these guys are going to be coming next season and the season after that. I’ve worked hard to get there, though,” said Bolt, who beat rival Tyson Gay to the finish despite the American setting a new national record with a time of 9.71 seconds, and compatriot and former record-holder Asafa Powell. Bolt also felt the performance demonstrated how he had improved his technique since his imperious displays at the Olympics in Beijing. “I got a good start. That was my main aim and then my drive phase overall was good. I got out of my drive phase and I saw I was leading and, when I got to 50 [meters], I knew it was going to be hard to get past me because that’s the strongest part of my race,” Bolt added. Bolt’s new mark shaved 0.11 seconds from his former world record time of 9.69 set in 2008, a dramatic feat when it is considered that prior to this seven athletes had taken 39 years to reduce the time by 0.21 seconds. The Jamaican’s coach, Glen Mills has said he feels his charge can run 9.52 eventually, but in the short-term attention now turns to the men’s 200 meters at the World Championships, a discipline in which Bolt is both Olympic champion and world record holder. Heats start on Tuesday in Berlin, but Bolt thought it would be too much ask for another world record to fall in the final come August 20. “I doubt I’m going to get the World Record in the 200,” he said. “I’m going out there to run hard, definitely, but I think it is going to be even more difficult,” he told the IAAF. “I haven’t run 200s much all season because I don’t think I was really in 200 shape,” Bolt added.